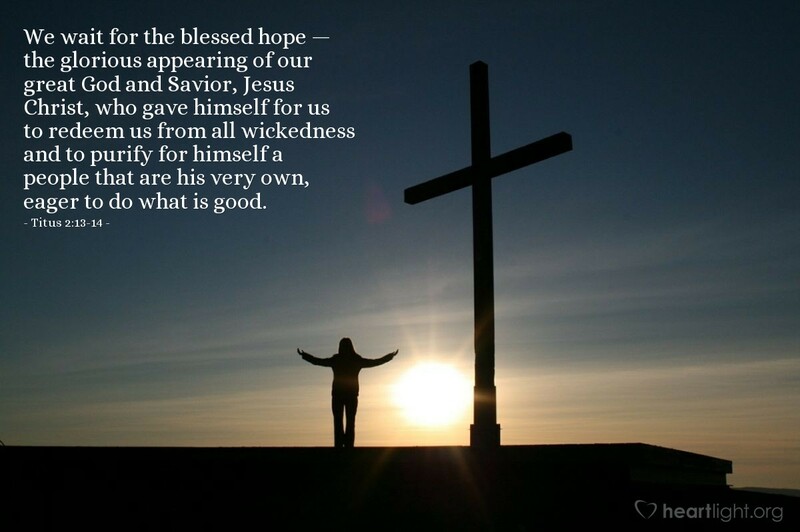 We wait for the blessed hope — the glorious appearing of our great God and Savior, Jesus Christ, who gave himself for us to redeem us from all wickedness and to purify for himself a people that are his very own, eager to do what is good. We haven't arrived at our destination (cf. Philipppians 3). We are in waiting! Jesus, who offered his own life for our redemption, will gloriously return to take us home. During our time of waiting, let's be eager to do what is right, good, and holy. Father, make me holy. Holy Spirit, make me eager. Jesus, make me glorious. Do these things for your praise and for the blessing of those who need to know you better. Please forgive me for the times I have settled for mediocrity and stir me to a holy passion to belong to you. In Jesus' name. Amen.